This week we took a stencil and then modified it to give our own styling. He-Who-Must-Not-Be-Named and I drove out to a farmers' market and picked an awfully large pumpkin, along with some smaller decorative gourds. We found a stencil based loosely on a Halloween movie poster, then tweaked it to meet the size/shape considerations of our pumpkin. It was good practice, and really got him thinking about the idea that you're not beholden to the directions, as long as your end product keeps to the spirit of the original plan. 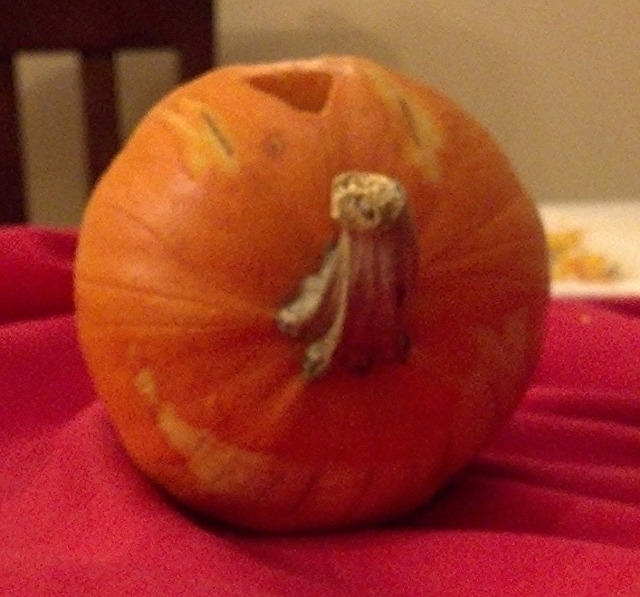 We also got to make small gourd faces, and what could be more fun than that?